The HELP Appeal is the only charity in the country dedicated to funding hospital helipads and relies entirely on public donations and contributed a total of £700,000 to help fund the helipad. That’s an average of around 250 landings every year from the Scottish Air Ambulance and Coastguard services. The average number of landings every week has also risen from three to fourin comparison to when the helipad was two years old. The Queen Elizabeth University Hospital is a 1,677 bed acute hospital located in Govan in the south-west of Glasgow. The hospital comprises a newly built 1,109 bed adult hospital, a 256 bed children’s hospital and two major A&E departments, one for adults and one for children in addition to buildings retained from the former hospital. It is the largest hospital campus in Europe. It is also the largest single site employer in Scotland, the second being Faslane naval base. 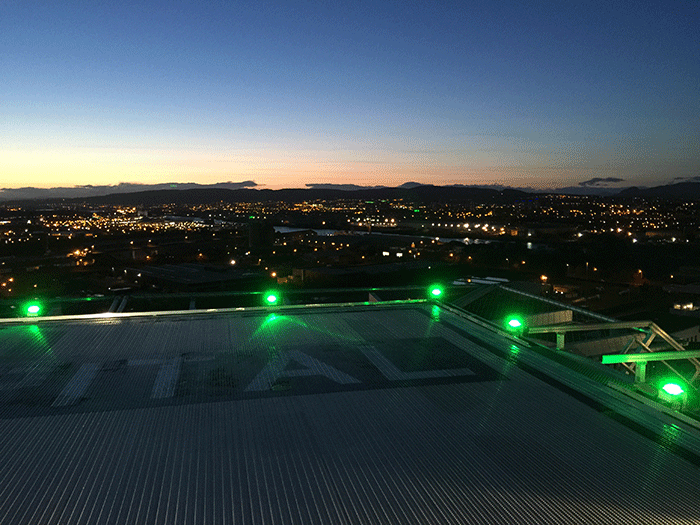 The rooftop helipad became operational in 2015 and enables patients across Scotland with critical illnesses or injuries to be flown directly to the hospital to receive immediate lifesaving treatment. “Everyone is aware of the vital roles that hospitals and air ambulances play in treating a critically ill patient, but having a helipad beside the emergency department can play a significant part too as it saves time when transporting a patient to the expert care they need to save their lives. This is why we felt compelled to get involved and help the hospital as we knew the difference having it onsite would make. If you read the article it explains that the hospital is a centre of medical excellence for all of Scotland, which is a mostly rural country, hence the unusually large emergency helicopter patient attendance. While Glasgow has some serious violent behavioural issues it does not bare comparison with London in this respect. The attempted sarcastic statement is therefore neither appropriate or accurate. Probably was it was sarcastic, then. Great to see a RN Sea King on the pad but I think that is an old photo. I don’t know the current situation in Scotland but Scotland did have a far superior service. Meanwhile, back in England, we had to rely on charity air ambulances for the same coverage during daylight hours only. As the caption says, this is before the type retired. To be fair, the South West region benefited from 8 SAR helicopters stationed at RNAS Culdrose, as well as the standard air ambulances. In North Yorkshire, which is so large, we have to rely on two charity air ambulances. One is based at the old RAF Topcliffe and the other at Nostell courtesy of Lord St Oswald of Nostell Priory who donated a former warehouse, offices and land. Scottish Ambulance Service have 2 helicopters & 2 fixed wing. Additionally Scotland’s Charity Air Ambulance have 1 chopper & currently fund-raising for a 2nd. & Scotland accounts for something like 50% of MCA heli-rescues with Prestwick being busiest station. Ah good to see the Queen Elizabeth University Hospital getting some good press for a change. Our helipad got shut because the Downwash from a landing air ambulance knocked over someone’s plastic garden chair…..